Giants fall from the sky. Wolves and old women eat children. Young girls break-and-enter to steal porridge from unsuspecting families. 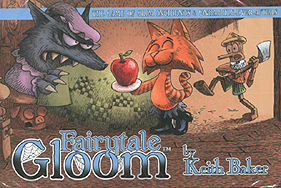 Fairytale Gloom is a card game about what really happens to fairy tale characters like Jack, Gretel, and Puss in Boots. Unfortunate tragedies where heroes are fooled by foxes, give up on Grandma, and cry wolf once too often. Unique transparent cards stack on top of each other to make scoring easy. The points you can see are the points in play - its that simple! Comparable with Gloom and all its expansions.